Holiday foods and homemade food gifts. An Australian reader asked me how to make candied sweet potatoes after reading about the food we eat for Christmas. We have candied sweet potatoes at both Thanksgiving and at Christmas. The rest of the year I just bake them and sometimes mash them. The recipe my mother used is the same one I found in her old cookbook, although I’m sure that the one her mother made didn’t come from a cookbook but they tasted similar. Maybe Nanny’s were a bit sweeter. The sweet potatoes are boiled and peeled. They are sliced and arranged in a baking dish with brown sugar and butter laid on top of each layer. They are then baked at 350 to 375 for about 45 minutes or until the syrup from the brown sugar and butter is as thick as you want it. I remember that sometimes parts of the sweet potatoes were crispy with the syrup. These days my oldest daughter, Jilo, makes the sweet potatoes for family gatherings. Candied sweet potatoes made by my oldest daughter for Thanksgiving dinner,2012. You can read about the history of the sweet potato here. I was surprised to learn that people candy sweet potatoes all over the world. I thought it was a recipe from the southern United States. mmm–The sweet potatoes look delicious. The recipe I always use to make sweet potatoes is similar to the one you use, but it calls for boiling the sweet potatoes (and leaving them whole, halved, or in large chunks), and then rolling them in the brown sugar syrup. We Australians have been missing out – I’d never heard of these either. Thanks for sharing the recipe – I’ll give this a try. 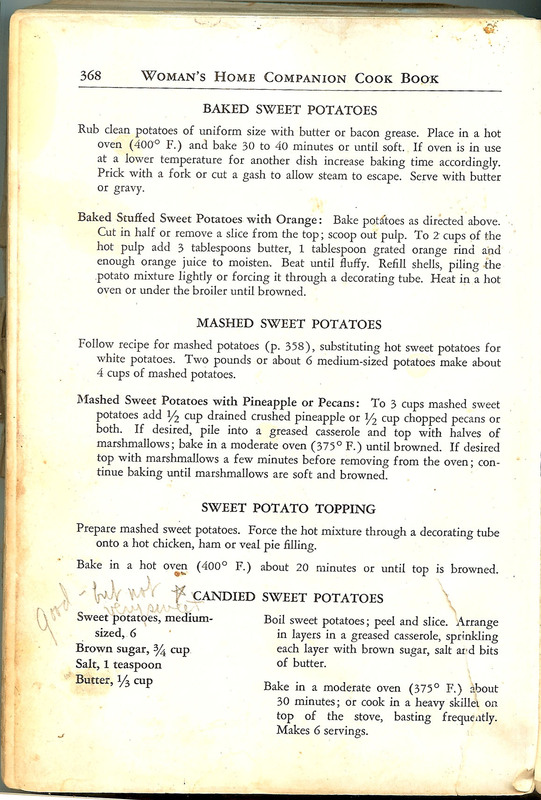 My Grandmother was an “Eliza” and a great cook, but I’m not sure that she ever cooked sweet potato. They are readily available now in the UK, but I don’t think they were before the 1960s. We tend to roast them with other root veg. Marinaded in oil, with balsamic vinegar and a few garlic cloves, pop in oven and roast. I’ll give them a try, but what do you serve them with or are they a complete sweet dish? The candied sweets potatoes are part of the total Thanksgiving dinner – turkey, dressing, greens, rice, green salad, perhaps another green vegetable, macaroni and cheese. For a stand alone sweet potato dish we make sweet potato pie. It’s rather like pumpkin pie – same spices, but uses sweet potatoes instead. I really prefer plain baked sweet potatoes with butter. Sometimes we do roast them with a chicken or other vegetables too. They are already sweet enough for me without all the added sugar, but it’s traditional. Candied sweet potatoes is a favorite dish for my family. I am a “lazy cook,” use a similar recipe. Sometimes I add a little pineapple juice or crushed pineapple to the dish. I love a cool baked sweet potato, peel and eat in all of it sweetness. I think my grandmother might have used some pineapple juice. She always had it around. In fact, pineapple is the only juice I remember having at her house. Thanks for sharing this recipe with us Kristin! We regularly have sweet potatoes ( a good substitute for pumpkin which one daughter hates) but I’d never bothered to find out about candied sweet potatoes…will have to give it a go. Happy Christmas to you & yours! Let me know how you like it. And a Happy Christmas to you too. Guess I better get off of here and finish wrapping those gifts!